This wonderful and creamy German Cheesecake is very light and each bite melts in your mouth. It is not too sweet. This is a dessert that always gets many wonderful compliments. Sift the flour, stir in the baking powder, salt, vanilla-sugar, lemon peel and sugar, then rub in the butter and knead to a smooth consistency with the egg. Place dough in a plastic bag in the refrigerator for 1 hour. Preheat oven to 300 degrees F (150 C). You will need a 9 or 9 1/2-inch springform pan. Roll out the dough on a well-floured work surface, then form it into a ball again and roll it out a second time. (This dough is the worst behaved of any I have ever had to deal with, but the double rolling helps tame it, and the end result IS worth the hassle). Place dough in bottom of a 9 or 9 1/2-inch springform pan, pressing it up the sides almost to the top. Set aside. Beat the egg yolks with the sugar and vanilla-sugar until pale and foamy. Add the softened butter and beat well, then add the heavy cream and beat again. Add the quark and stir until the mixture is smooth and throughly combined. Whisk the egg whites with the salt until very stiff, then very gently fold in the quark mixture, also adding the sifted cornstarch a little at a time. Pour the filling into the crust shell and gently wobble the pan back and forth until the surface is smooth. Trim the dough, leaving about 1 inch (2 1/2 cm). Bake in preheated 300 degrees F (150 C) oven for 50 to 60 minutes (longer if necessary) until well risen and golden - it resembles a souffle at this point (It will sink in the middle quite dramatically - don't worry, it's supposed to do this). Turn the oven off, and let the cheesecake rest in the oven for 15 minutes; then remove it from the oven, cool for an hour or so at room temperature, and refrigerate for several hours before releasing sides of pan and serving. (I make mine the day before I need it). This cheesecake is very nice served with sliced strawberries, or a raspberry sauce. Keep cheesecake stored in the refrigerator, covered. There are 3 substitutions that can be used for the Quark in this recipe if Quark is not available. One is to use farmer’s cheese, another is to purée cottage cheese in a blender or food processor, and the third is to purée eight parts of ricotta cheese with 1 part of sour cream in a food processor. After reading the reviews, I chose to make my half-german boyfriend this recipe last summer. I am no baker, but this cake came out absolutely perfect. I was a bit short on dough, however, but we managed to stretch it. I also had to bake it 15 minutes longer than the recipe suggested. Very very good..the way we made it at home ..when i grew up .. It was truly delicious! Here in Lithuania, we do not have cream cheese, so I could not treat my family with a yummy cheese cake..But happily, in this recipe cream cheese can be replaced with cottage cheese! It was enjoyed very much and disappeared very fast! Even my mom, who does not really have a sweet tooth, ate almost half of it all by herself. Thank you so much, Diana!! Wow, i'm doing this for a german project and boy im sure their gonna love it! My boss requested this cake for his birthday. It turned out GREAT... much lighter than regular cheesecake and the crust was very easy to roll out and tasted moist. Watch carefully at the end.... I probably browned a little too much. Thanks for sharing this recipe on your site. This is the best cheesecake ever, seriously. I made it for my school project. My Dad's side is German, so this cake really was a welcome change from the New York Cheese Cake you get in America. For America, this cake is excellent, for many of the ingredients that make German Cheese Cake so incredible are not easily purchased in America. Great recipe, but it could be just a bit lighter in the filling. WOW, thats good cheesecake, never had anything like it before in my life! Absolutely delicious! One of the best cheesecakes I have ever eaten. German people sure know how to do cheesecke! This is almost exactly like I learned how to make it from my Mom in Germany, but the raisins are missing! After searching for 4 years for recipes and making at least 1 dozen different cheesecakes, I found at last the genuine German cheesecake. Bless you. I compared this with my mother's and Oma's recipe and it is a match, which I recently backed. I don't have the original recipe from mom, but I remember making this with her and recently found Quark at our local grocer. This cheesecake is awesome!!! I grew up in Germany, so when I moved to the States I quite missed German Cheesecake. I couldn't find Quark so I thought that I would never be able to make this kind of cheesecake, but I used the cottage cheese and it worked just fine. Thank you so much!!! This is exactly like the cheesecakes we had when we were stationed in Germany. Delicious! It took longer to make than I expected, but it was well worth the effort! truly amazing- I used the cottage cheese (low fat) option, and it still came out perfect!!! As I was in Germany, my German friends baked Kaesekuchen for me several times. All of my family enjoyed eating it. I tried to make it in Iran and after looking several different recipes in internet and books, I found yours the best one and I tried it. It was really excellent. Very good recipe. I work with many Germans and they all agreed that the cheesecake was delicious and authentic! Its OK, but nothing beats a NY cheesecake from Juniors! WOW, This is the best cheesecake I have ever tasted. I made it four times; one of them for my friend's birthday. The recipe was surprisingly easy to make, and came out very nicely. I was worried about it cracking, so I put a small pan of water in the oven with it, baked it on a cooking stone, and let it cool slowly in the oven for an hour instead of just 15 minutes. It did take considerably longer longer to become golden on the top than the recipe indicated, although this may have been because of the water, so I wound up baking it for closer to 90 minutes, instead of 60. It did come out beautifully, though, and didn't sink in the center nearly as much as I anticipated. Also, I used 1 pound of cottage cheese pureèd together with 1 ounce of sour cream in place of the Quark, which I did not have available to me. In any case, a great recipe. Thank you so much. Thank you so much. I found an AUTHENTIC German cheesecake for my school project. U ROCK! Its great! I love the crust especially, and would suggest the cottage cheese... I am using it for a German class project, and am sure my class, and my Austrian teacher, will love it! Thanks! I have been searching for years and have finally found it. My Oma passed on before she could tell me her recipe. It was the last one I was waiting on and know that this one comes very close. Thank's for helping me relive wonderful childhood memories. I'm going to make this for my German class mini-Fest. I think they are going to love it. My husband is German and was looking forward to me baking this cheesecake so he could compare it too the one his mother made when he was a child. I am pleased to say he was not disapointed. I am making another one this weekend and just hope it turns out as good as if not better than the first one. Well worth the effort. His colleagues at work all thought it was delicious too. Wow, it is amazingly delicious. I never tasted anything like this. I really admire the girlfriend of my supervisor who made this cheesecake. She is great in making this cake; to be a cake to remember!!! This was my first cheesecake I ever made and I love it!! I'm German and it tastes almost exactly like the one I'm used to from home. Thank you for the recipe. Instead of rolling out the crust I simply squeezed it into the springform pan. That worked great. I also used homemade quark. I had to bake the cake for about 75 minutes, but it tastes awesome. This is a brilliant recipe. Tried it out and it came out really well. Got a lot of compliments. It didn't crack as I left it in the oven to cool with door ajar for an hour after baking. I had to bake it for around 85 mins before it was done. Thanks for this tasty recipe. Can you use a sugar substitute, such as Splenda, to make it low carb? Just don't bother looking anywhere else! At last I can taste the cheese; the texture is brilliant and it tastes like a proper cake instead of the over-sweet plastic cream processed American rubbish which doesn't taste like a CHEESE cake at all - more like a glorified ice-cream. Aufweidersien Pet! Forget NY - going to Germany! thanks. i'm using this for my school project! I have made this cheesecake 3 times now, the first two times using ricotta and sour cream, and now the third is baking right now with quark that I finally found. This recipe is excellent, and each time the cheesecake has turned out moist and creamy but with the consistency I expect in a German cheesecake. The ricotta and sour cream mixture I think most resembles quark in consistency and flavor. My German grandmother loved it! My husband is German (he's only been in the States for one year) and he loved the taste of this cheesecake. I loved it as well. I had to use the cottage cheese substitute but cooked it about 90 minutes and it did brown on the outside. The crust was excellent but the inside seemed more like it had a pudding type consistency rather than cheesecake. The lemon taste was slightly too strong but otherwise is really a wonderfully delicious cheesecake. Made this with home-made quark for christmas dessert, and it was such a hit I'm making another to bring to a new year's eve party! This recipe and the outcome of it are just amazing. I am German and I know exactly how it comes out and this is exactly how it should be. Everybody loves it! I haven't tasted the final product yet, but just the filling is delicious (I tasted it without the egg whites, salt and cornstarch)!!!!!!! This is truly delicious, yum yum yum! I have been looking for this recipe forever and have tried many different versions. Thank you so so much. You are my Kaesekuchen savior. Excellent .. It's just like the cheese cake I get from coffee shops when I visit Germany .. I only manage to make it when I go to Germany and get back home quark ... I usually bake it in a pan of water and it does not sink at all, but today the pastry did not cook well .. next time I'll try it out without the pan of water. I had been looking for a recipe that would resemble the cheesecake that I bought at an old German bakery that went out of business. This is the closest: texture,taste, that I have found. However, I would like a lighter version, too rich. The version that I bought from the bakery, was half crust and half filling,and was lighter but with the same texture. Love this recipe. Delicious with hot cherry sauce. It turned out perfectly and I shall make it over and over. A hit with my guests. Thank you. I'm German and Americans love this cake anytime I bake it. As one girl already said, it's fine to press the dough into the pan but you should also prick it with a fork before putting the filling in, that will give the dough a chance to get some "air" while baking and makes the crust less dense and keeps it from burning too easily. As for the Quark - here in Illinois we have a lot of produce markets which all have a lot of international foods available. There is one company called Lifeway that makes all kinds of farmer's cheese types and they make a "swiss style twarog" (-> Polish for Quark I've been told) or a Polish name twarog) which is almost identical with the Quark you buy in Germany. In Germany it is also very popular to put mandarin oranges (drain very well!) or raisins into the cake. Enjoy ! Hi, made this recipe several times and am very happy with it. Everyone loves it. I substituted pureed cottage cheese and it was fantastic. Only problem I found was that it took significantly longer to bake than 50 minutes. Very delicious. The taste is just nice; not too sweet and not too rich. Will definitely be my all time favourite ! Haven't tried it yet - just wondering if there is adjustments for high altitude (5000 feet)? This recipe sounds really great. 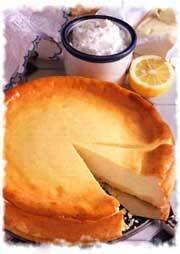 I'll make it this weekend and compare with my other cheesecake recipes which never fail. To make handling the dough easier roll it out between two pieces of shrink wrap. When rolled, wrap the rolling pin with one piece of the shrink wrap then lift the pastry onto it with the other, gently lower pastry into the pan and carefully tuck it down into the pan. I always prick the dough with a fork and also bake blind for a few minutes to seal the dough before adding the filling. This prevents soggy pastry. Thank you for this fantastic site. There is no need to go anywhere else! From reading the other reviews I know the cheesecakes are good. I like cheesecake myself and hope to try your recipe someday. Yum, it was so good! Light, fluffy, delicate and delicious, Just like Oma used to make. It does need baking longer than indicated but the predicted collapse after taking out of the oven didn't occur. Turned out delicious! I'm German, and just returned to Europe after living in the US for 4 years with my Austrian boyfriend. I had promised to make him German cheesecake, and after much internet research I settled on your recipe (because most "classic" recipes that you find on German websites use a package of vanilla pudding powder, eww! What's up with that?) I added the zest of a whole lemon to the filling too, in addition to the lemon in the crust - so delicious and fresh! Everybody loved it - even my Dad, and he's quite the "cheesecake gourmet" and really picky! I might go a little easier on the sugar next time (1/2 cup instead of 3/4 cup) because I like things less sweet, but this recipe is a keeper!!! Thanks Diana! The best cake I have ever had! Excellent. Everyone who tried this cake loves it! Many people ask me for recipe and I give them this link! We all loved it! Thank you Diana. This is definately the best cheesecake I have ever eaten. Much much better than some complicated ones. What a delicious recipe, and it didn't sink either. Now my family always ask me to make it for family dinners, just made another one, can smell it baking right now, yummmmmmmmmm! Thank you from Ireland! Best cheesecake ever!! Thank you! I found this recipe when looking for one like my Mom used to make. I love this kind of crust but as we lived in countries where different cheeses were hard to find we always used a really thick yogurt/unripened cheese from the Middle East and some cream cheese which we began to find in really small packets (2 Tbsp. size each square 6 squares to a pack each individually wrapped) This worked quite well. Wow, im gonna use this for my geography project about germany!! thanks for the help! I have been looking for this recipe for a long time. It tastes just like the cheesecake my German Grandma used to bring to our home. Great! Perfect!! Thank u so much! In the middle east we use "labna" as a quark substitute, And it's still ammmmazing!! Diana, you're a genius! I stumbled across this site by accident but needless to say I saw the German Cheesecake and said I would make it for myself for Mothers Day. It is very tasty and for that I give 4 cakes but it still is not like my Oma's that I truly miss. I used the cottage cheese substitute for quark but I have found quark on a site called Igourmet.com. This was delicious! I don't have a springform pan so I made this in two 8"x2" straight-edged cake pans. I used lowfat cottage cheese as a quark substitute, and it turned out really well. This was great! My almost 70 year old mom said it tasted like my grandfathers cheesecake. My Dad said it would have been even better with some raisins in it. Thank you, you have helped us bring back memories... A recipe I will hopefully be able to pass on to my boys. I did have to bake it for 70 minutes though. The best German cheesecake, thanks. I must say that this cheesecake was just what I've been looking for. Since I found this recipe it became a almost weekly dessert here. My husband is german and he just loves this cake. Thanks and greetings from Brazil. This was a fantastic recipe. I grew up in Germany from the age of 5 to 19, so am VERY familiar with German cheesecakes. I have been looking for so long to find a recipe that is truly German. Here in Australia, their cheesecakes are just this dense "thing" that you just set in the fridge. Really nothing like I was used to. I made this recipe last night and it was fantastic. I will try to prick the base though, as I thought the crust was delicious, but a little too hard/tough. Also, I am just a beginner at baking, so I probably didn't do it correctly anyway. Thank you so much for posting this. i absolutely LOVE it. My husband is German born and raised. His mother bakes this cake every year on his birthday as it is his favorite. This year since we have move to the US away from his family,I decided to make it for him. I had to make the quark by letting buttermilk stand in the oven on warm overnight and draining it the next day with cheesecloth. Wow this was great! It brought a smile to my husband's face on his birthday. A big thank you from our family! I have yet to actually make this but from the other comments I know it will be just as my Oma made (I never managed to get the recipe and have been searching for years). She also put golden raisins in it and used a dough called "muhrbeteig" which one could just push into the pan and move it where you wanted it to go up the sides. I MUST make this right away. Vielen dank! I used the ricotta/sour cream version. I did find quark but i dislike cottage cheese so I didn't want to take a gamble and spend time on something I may not enjoy the taste of. I'm sure if I used cottage cheese or quark the mix would be a lot heavier and of course a lot cheesier in flavor. It took over 2 hours to cook and only started rising after an hour. I think that the oven should be at least 160-165 degrees C if you don't have fan forced. I feel the heat is what really delayed it cooking and rising. I turned it up a bit higher towards the end but making sure it wasn't cooking it too quick or browning my base too much as for its not like cooking a cake, etc. It is super light in texture and mild in flavour. I did some chantilly cream and made raspberry coulis to go with. It's nice to have a cheesecake that isn't so rich you cant eat it all, so this is perfect! I read the reviews on this cheesecake and I decided to make it for my German Class. Everybody loved it! This is very close to how my Oma and Mom always made it, but we always used more cornstarch and it's not so moist in the middle or take so long to bake. Also my mom always puts a thin layer of apples on the crust before pouring on the filling. This gives it a lovely tart flavored layer! just made up a double batch...first following a recipe for making my own quark from buttermilk (worked like a charm) and then making a few quarkkuchen. Wow, after ten years away from Germany, had forgotten how much I missed the extra special taste of quark. thanks so much for this excellent recipe which I will now use many times in the future. I have to bring more vanillenzucker back from Germany next time, ran out! Missing the raisins but other than that, it's perfect! I learned to make quark at a cheese class I attended in April. We have our own Jersey cow so we are always looking for delicious recipes for our milk. Since then I have been experimenting with quark and this recipe is the best. The reviews from my family and friends are over the top. I made two cheesecakes with this recipe and they were excellent. One was dark chocolate mint and the other raspberry with white chocolate. Even with the add in the recipes is the best! Thank you for posting it! Excellent! Picture perfect! First cheesecake that doesn't come out a mess! I love to eat cheesecake but hated to bake them because it never came out right. I LOVE THIS RECIPE! Like going home to my mom. Crazily enough it is the exact recipe she uses and has used for almost 70 years. Best ever, anywhere, anytime!!! I made this cake for my German father. He loved it so much he said it was better than his mother's version. Now, that is huge! I used 9 parts ricotta and 1 part sour cream, can't find any quark in Australia. taste is 10/10. just like how i remember it in Germany. I had this in a home in Germany, and have been looking for a recipe for it ever since. This is it! Thanks for offering it with volume instead of weight measurements. I have moved to Germany from Australia ..and I love the cake. In every bakery they have Kasekuchen. Thank you. I am German and I have found another excellent quark substitute in the US, just use plain Greek yogurt. It also works as a quark substitute in German desserts and other cake recipes. Almost like Oma used to make it ... Almost. Had to use substitutes, since Quark and vanilla sugar aren't very common items in most grocery stores, but it still came out amazing. Having lived in Germany for 8 years as a kid, I missed real German Käsekuchen. New York style just wasn't quite right. Thanks for bringing back childhood memories! *** It did take a good 75 minutes to reach the right color and consistency. *** Another good sub, that we used, for Quark was 8 parts ricotta cheese to 1 part Greek yogurt. I am German and have been baking since I was 8. This recipe looks similar to my moms and another great substitute for the Quark is Greek Yoghurt. My mom was from Berlin. She made the best cheese around. "All her cakes were very good". This is just like her cheese cake and her secret was the lemon, and more sugar for her American friends. Her German friends made it but only with vanilla and was never as good. She also used neufchatel cream cheese and sour cream. Thank you for this recipe as my mom passed away and my sisters took all her things. I enjoyed making it and will continue to, brings back a great memories. I must say this was my first attempt and I did use half quark & half curd cheese since I didn't read the recipe properly before I went shopping but it worked out lovely. Great recipe! I am Belgian and living in the US in a small town. Ingredients are difficult to find as well as fresh products. Thanks to your recipe I was able to make a cheesecake that is not so heavy and upset my stomach! The crust was a little bit too crispy but it was a good idea to use cottage cheese in the blender as a substitute for quark. I could not vanilla-sugar so I use extract but it is not the same. Will have to buy some one going to a bigger city. Thanks! I have been now in the US since 1984. I miss my German Bakery still. I finally decided to make my favorite cake (Kase Kuchen). I looked at lots of recipes and decided to go with this one. Wow just like home :). It turned out great! AMAZING... could not stop eating the filling before it was poured onto the crust. I use quark to make this cake and i do it without the base its scrumptious and so easy to make one of the best i have ever tasted . I disagree--the dough for this cake is a dream. Instead of following your instructions, I did what I know learned from prior, German recipes. I let the dough stand out on counter for half an hour as I prepared the filling. This is the magic of muerbeteig: it is a sticky, glom when you finish mixing it, and you can't knead it properly. Then once the dough has rested for half an hour at room temperature, it is elastic and easy to work with. I did use my pastry cloth, as I do for this type of crust, and it makes transferring the dough to the pan much easier. I am very much looking forward to experimenting with other recipes on your site. The recipe is the best. The cheesecake is really like our real german cheesecake that we've had when we lived in Germany. And the substitution of quark is VERY HELPFUL!! We cannot find any quark here in Indonesia. Thanks a lot for the recipe, Diana. We love your recipe! Tried to make it, but was so frustrated with the dough. A big waste of my time, ingredients and ruined my mood. That's the best recipe I found so far!!!! Easiest way to replace the quark is mix the amount you need out of half cream cheese and half sour cream! I also replaced the heavy cream with eggnog ( for the holidays) and it was awesome!!! This is a fantastic dessert recipe, followed it to the letter and instructions. The only change I made was I used lemon quark, outstanding flavours and textures. Thanks for the recipe. Turned out great and so yummy. I substituted the quark with Greek Yogurt. I have been making cheese and tried quark, so decided to try this recipe. I halved the sugar in the filling and used all quark - no cream, and it came out lovely and grainy and not too sweet - just the way I like it. I will be making this again! thanks so much! Found this recipe after receiving Quark in a farmshare. Never had quark before but this recipe was excellent for a first time experience. I did have to bake it for about 75 minutes before it was golden on the edges. So delicious and we look forward to quark in our share again! I have eaten kasekuchen in Germany many times and this really hit the spot. I stayed true to the recipe except that I didn't have vanilla sugar so added approx 1/8 tsp vanilla to crust and filling. It may have been more than needed to stay true to an authentic German recipe. Amazing results anyway, I will definately make this again. Thanks for sharing such a great recipe! I can't wait to make this cheesecake. I love German baking. My mom passed away in 1993 and no recipe left to us kids neither knew what was in it.This is just like mom's a true German version.but i did remember one item she would use its Philly cream cheese as a booster to the cottage cheese as quark is hard to find in Canada she would use 2 packages of Philly so adjust the recipe slightly for a real cream cheese boost.It took me back to my childhood thanks great work ENJOY!! !